Group of people posing outside of Soldiers' Orphans Home, located on Spaight Street between Paterson and Brearly Streets. The building was originally constructed by Governor L.J. Farwell, about 1853, as a private residence. 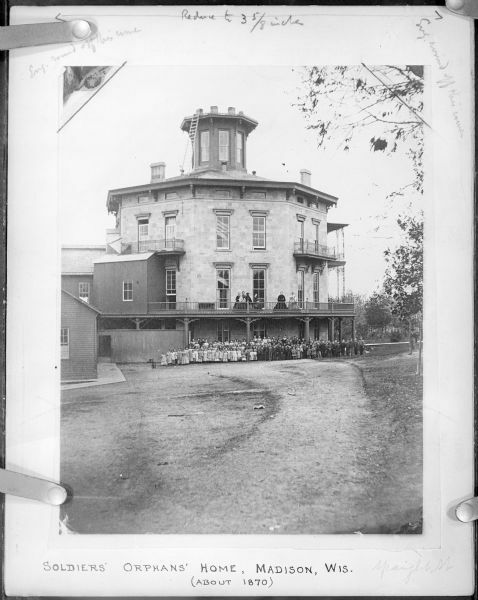 It was opened on January 1st, 1866 as the orphan asylum; Mrs. Cordelia Harvey, widow of Governor L.P. Harvey, was in charge. According to The Jefferson Banner, 23 January 1867, this photograph was sold for $3.75, with "35% of the proceeds to go for the benefit of the home . . . Every person should purchase a copy and thereby assist the soldiers' orphans of Wisconsin in obtaining an education." Hand-written on the reverse of 3-2495, "Madison, Wis. - Harvey Hospital, Governor Farwell's home - Spaight Street." Text on the reverse of 3-2495, "The Governor Farwell Home - Spaight Street. Purchased by Gov. L.J. Farwell, partly in 1847 and he continued on making purchases from various owners, including the State and county, up to 1853. In 1856 he gave a mortgage for $10,000 to Samuel Marshall and in 1860 Gov. Farwell gave a quit claim deed to Samuel Marshall, J.A. Ellis and C.F. Farley. In 1866 Marshall and Ilsley deeded the property to the State of Wisconsin. In 1876 the Regents of the University deeded the property to H.A. Preuss, I.A. Ottison and Hallie Steensland. Apparently this was for use as the Norwegian Evangelical Lutheran Church, or some such purpose. A mortgage was given back for $13,000 on the property. Later Steensland, et al, deeded it to the Norwegian Church. The Norwegian Lutheran Church held the property until 1894, when they sold part of it for $23,000 under land contract to John Ollis, et al. Thereafter it was gradually sold by the Norwegian Church until the property was entirely disposed of."